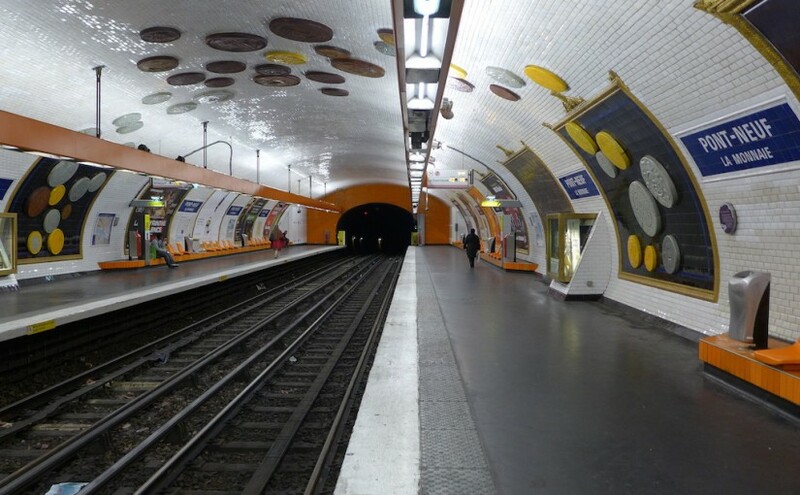 Our Metro Station of the month is located in the first arrondissement of Paris, on Metro line 7: Pont-Neuf. Its complete name is indeed Pont-Neuf La monnaie. What I like in this station is the beautiful reproduction of huge golden and silver coins which decorates not only the walls on both platforms but also the vault. This decor refers to the Hotel de la Monnaie, which is located on the left bank only a few meters walk from the metro way out after crossing the Seine. One can also admire on each subway platform a showcase in which the last creations of the Monnaie de Paris are displayed: currently a coin with Asterix and Obelix’s faces on it. Back to earth: Do not miss the Hotel de la Monnaie of course, which shelters the Monnaie de Paris. It is presently being renovated and partially open. On 19 May 2015 the famous 3-star restaurant Guy Savoy is scheduled for being transferred from the 17th arrondissement to the Monnaie de Paris! To get there cross the Seine on the Pont-Neuf which is… the oldest bridge in Paris, unlike its name! When it was built in the second part of 16th century, the Pont-Neuf was really new as it was the first bridge with sidewalks and without houses on it. It is today one of the most beautiful bridges accross the Seine in Paris and was made famous by Christo who wrapped it in 1985 or by film directors, such as Léos Carax with its remarkable movie ‘Les Amants du Pont-Neuf ‘(1991).